Be a part of the mystery, be a part of the fun! 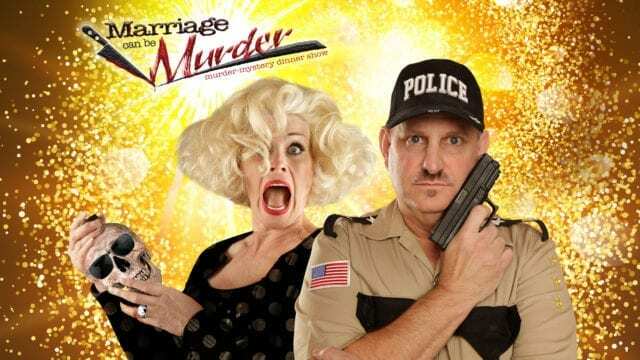 Nightly at 6:30 PM inside the newly renovated Showroom at the D Las Vegas for a murder-mystery dinner-show like no other. Actors are planted throughout the audience so you’ll never know if the odd person at your table is an actor or just an odd person! You’ll be thoroughly entertained during this 2-hour experience which includes a three-course gourmet meal all served at your table while you try to figure out “who-dun-it”. * All tickets include the show, 3-course dinner, non-alcoholic beverage, & server gratuity. Vegas4Locals discount price $67.99 (inclusive of taxes & fees), save $22! Vegas4Locals discount price $83.99 (inclusive of taxes & fees), save $22! * Extras include priority upgraded seating, 1 alcoholic beverage & a souvenir t-shirt. 6:15 pm, 7 days a week; Doors open and salad service begins at 5:45 pm nightly – actors are planted throughout the audience so some say the show starts when the doors open!